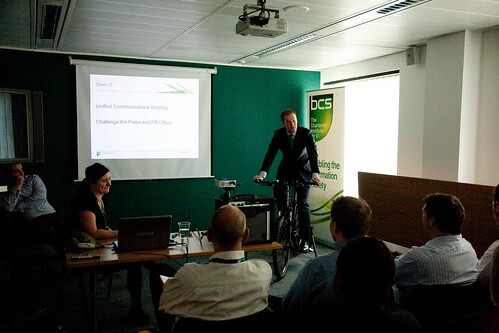 We really got the guys at BCS, The Chartered Institute of IT sweating earlier today! As a kick-off for Climate week, they'd decided to do their Green IT presentations to colleagues without the use of fossil fuels! One of the guys Chris, although not a regular cyclists, did well to pedal and talk though 19 slides of sustainable strategy .. sterling stuff. The audience loved it as it really add a new dimension to presenting! and because we were using our highly portable Pedal Powered Cinema, we did the whole thing by train!